HMS Albion (L14) the ninth ship to bear the name in the Royal Navy was built by BAE Systems Marine, Barrow-in-Furness and launched by The Princess Royal on the 9 March 2001, commissioning on 19 June 2003. She was the Flagship of the Fleet following the early decommissioning of Ark Royal in March 2011. She has taken part in many exercises and hit the headlines in 2010 when she brought home soldiers and British citizens from Santander in Spain, during the air travel disruptions following the Icelandic volcano eruptions. She displaces 21.500 tons, at a length of 577 feet 3 in. with a top speed of 18 knots. 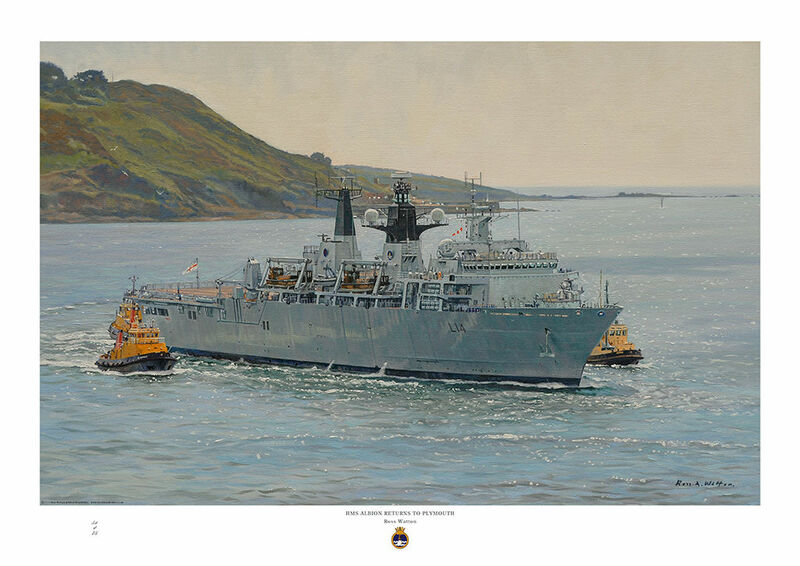 The ship is shown entering her homeport of Plymouth, the painting was commissioned, and is owned by a former commanding officer.